As writers, we want to write and we want to publish. That doesn’t seem like such an overwhelming desire, after all, there’s lots of places to publish. I’ve been published for over thirty years in a variety of venues: journals, websites, newspapers. But what we really want is to publish a book. That goal has been elusive for me and perhaps for good reason. Perhaps I simply wasn’t ready to take on the daunting task of marketing and selling a book. As writers, we love to write. Marketing? Well, not so much. That’s a different set of skills all together and I’m learning a new appreciation for the many published journals that have been kind enough to do all the work to get my work out to the public. Now it’s my turn. I have a publisher and a book coming out in May, titled At the Boundary. It’s been a huge task getting it ready, copy-editing, asking for reviews, getting a new photo, the list seems never-ending. And now I’m in the marketing phase. Marketing turns the focus from me to you. What is it in this book of poems that you need? Do you need it because you know me and want to support me regardless? What a cool thing that is! Thank you. Do you need it because you’ve been following my blog for a while and want to know more of my writing life? Or life in general? I’ve certainly learned a lot about life in my writing. Or do you need it because we all go through our seasons and lives and we all need to know how others have turned and grown and made their transitions in life? That’s what the crossroads are all about! But marketing also turns the focus back on me. I need your support. So I’m asking for it. There’s a deadline for pre-orders of March 6th. If 55 copies haven’t sold by then, my book won’t be published. I understand. Publishing is a dicey business at the best; and in these days, there’s a lot of the worst. And so, I need your support just as the poetry press, Finishing Line Press, needs my support in marketing. To order, go to http://finishinglinepress.com. You can get there by clicking PREORDER FORTHCOMING TITLES. 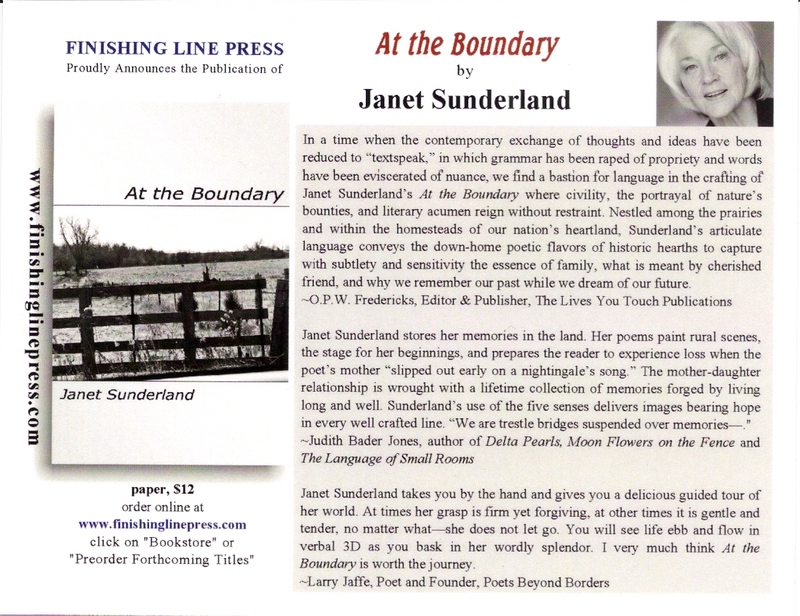 Scroll down the page until you see At the Boundary by Janet Sunderland. By clicking on that link you can read reviews or my bio and you can order. And before you even do that, Thank you. Thank you for reading and for wondering where I was in all the time that I’ve been absent from writing on this blog. Now you know what I’ve been doing! And thank you for supporting my work.